If one thing can be said about Osama bin Laden it’s that he likes to put out hilariously wacky home videos of himself. Noticing this tendency, the all too lovable and informative CNN was quick to capitalize upon it. Purchasing the syndication rights from Al-Jazeera along with a brand new pilot, CNN (realizing that it was never altogether comfortable in the field of objective news reporting) prepares to embark upon a new venture. Despite his busy schedule, Osama bin Laden now finds himself on camera yet again in a brand new situation comedy due to air on CNN sometime later this year. Despite the obviously hush hush nature of the show, portions of the highly confidential “top secret” season opener transcript can be found floating about the Internet. 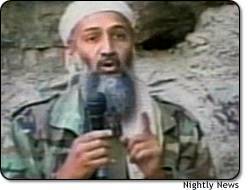 Nevertheless, Lance and Eskimo Dot Com’s very own Jacques is the only one who has thus far been able to piece together a comprehensive overview of the Osama bin Laden pilot episode! East and West meet in this hilarious new situation comedy from the producers of Friends... Who Like to Kill People; Frasier, Whom We Would Like to Kill; and Target: Will & Grace. Ayman (excitedly): He’s got it! What? What is it? Osama: I’ve got it. How about we wage a war... about nothing! Ayman: A war about nothing. Osama: A war... about nothing. Ayman: Great, a war about nothing. What do you mean? Covert or something? Osama: We just go on and wage a war... over nothing. Ayman: Like killing the infidels? Osama: No, no. Nothing at all like that. Ayman: I still don’t understand. Osama: What did you do the other day? Ayman: I blew up an American embassy. 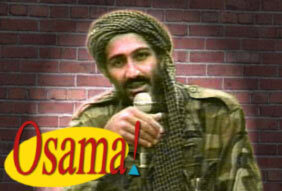 Osama: You see! Right there. We can make a war about that. That, my friend, could be a war. Ayman: Nothing. And we could even incorporate some subplot about a miscreant butler... who has an affair... with the gardener’s wife! Osama: But you’re missing the whole point of the war. Ayman: You mean we wage a war for absolutely no reason at all? Osama: Exactly. Absolutely no reason whatsoever. Kramer (explaining as hands flail about): You’ll never guess what I just saw. I was coming down the street and all of a sudden BAM out of nowhere I saw a female earlobe. Ayman: What do you mean you saw a female earlobe? Kramer: I saw a woman walking down the street with her earlobe just hanging out in plain view! Osama: Just hanging out there? Osama: That’s amazing. What did you do? Kramer: Well I stoned her. But man was that some earlobe. Ayman: Why can’t I ever see an earlobe? Just once, I’d like to see an earlobe. Ayman: A woman walks down the street with her earlobe just hanging out in plain view, and he sees it! This is not fair. That’s my life. Osama: You can see mine. Ayman: But it’s just not the same. Kramer (getting a drink): So, what’ve you guys been talking about? Ayman: It’s an idea for a war we had. Osama: Oh, now “we” came up with this notion. Ayman: Yes, we came up with this notion. Osama: I think I came up with this notion. Ayman: Fine. Take all the credit. I sat here too you know. You just got lucky. You got lucky. We were both on the same track you know! We were working together! We’re a team Osama, a team! Osama: Fine, we came up with it together. Kramer: A war about nothing, eh? Kramer: We can blame it on their treatment of Iraq. Ayman: We can’t blame it on their treatment of the Iraq. Ayman: We don’t even like Iraq. How we can’t blame it on Iraq. Kramer: We don’t like Iraq? Ayman: Not the last time I checked. Kramer: Huh... Well then blame it on the Jews. I’ve never liked the Jews. We’ve got to do something with the Jews. They leave a bad taste in my mouth. [puckers his mouth and licks his lips disgustedly] Ahhh. How about a war over the Jews still existing? Ayman: No! Absolutely no point to it at all! That’s the beauty of it. You see, we just wage war over nothing at all. Osama: Well we’ll definitely have to do something about Israel and Iraq. That’s just obvious. I mean, we can’t just have Israel around. Ayman: What? You’re making reasons now. This defeats the whole purpose of going to war Osama! There are boundaries in war Osama! Boundaries! We start making excuses and the next thing we know we’ve got a purpose for the war! A purpose! And then we don’t know what the hell we’re doing anymore! Boundaries colliding Osama! BOUNDARIES COLLIDING! Osama: But come on, Israel? It would just mess everything up. We’ve got to do something about Israel. I mean, the Jews? What are they still doing around? The Jewish government doesn’t even sponsor the killing of children or flying of planes into buildings. Where are their values? What could they be thinking? And we can’t openly endorse any country that doesn’t have a beard to person ratio of at least one for every two people. Did you see the guy who flew the plane into that building? What was up with that guy? He didn’t even have a beard. And the U.S. won’t even let Iraq gain advances in nuclear science. What’s the deal with that? Israel and Iraq are definitely on our list of U.S. grievances. Kramer: Kashmir, throw Kashmir in too. Osama: I’m not going to throw in Kashmir. Kramer (whining): Oh, come on Osama! Come on! Osama: When you start your own jihad, then you can do whatever you want with Kashmir. Osama: What’s he doing here? Kramer: Get this Osama, Saddam and I are going to start dealing in Anthrax. Osama: What’s with you and Anthrax? Kramer: Everybody’s talking about it and we want in. With Saddam’s connections in biology and the post office, we’re going places baby. Kramer: Oh, you can count on it. And we’re also going to start a new line of bacteria called “Kramer and Saddam”. Osama (sarcastically): Oh yeah, this sounds like a good idea. Saddam: I thought it was supposed to be “Saddam and Kramer”. Kramer: We’ll work on it. Come on. Gidyup. Ayman: Well, that’s it for me. I’m off. Osama: I don’t know. I’ve got a huge problem. I just don’t want to go home. Osama: I forgot my 4th wife’s name. Ayman: You forgot your wife’s name? How can you have forgotten your wife’s name? Osama: I don’t know. Everything happened so fast. And then we were married... and I couldn’t ask then. Ayman: Nooo. You can’t ask now. Osama: I know. What am I going to do? I’m a dead man. Ayman: You could just beat her. Osama: I could do that. Ayman: I wish I had a wife to beat. Osama: There’s nothing wrong with having a wife to beat. Ayman: That’s what people have wives for. Osama: Having a wife to beat is good. Ayman: Wives are meant to be beaten. Osama: What other possible reason could people have a wife for? Ayman: You mean to say that no one ever told you her name and you never asked? Osama: All I can remember is that it rhymes with an obscene part of the female anatomy. Ayman: Obscene part of the female anatomy? Osama: Obscene part... of the female anatomy. Osama: No, no, it was higher up. Ayman: Omarm? Cuticula? Nolder? Sty-brows? Ayman: Melbow! Was it Melbow? Osama (sarcastically thinking): Mmmm.... I think I’ll just beat her. Don’t you hate it when you’re beating your wife... and you throw out your back? I mean, you know you’ve got to bend with your legs... but you can’t efficiently beat your wife without really putting some back into it. If you want to be an efficient wife beater, then you’re just going to have to bend. There’s just no getting around the bending aspect. You never see an efficient wife beater without back problems, you ever notice that?... You can always tell a wife beater on the street from the way he walks. See some guy on the street... wife beater? “Yup.” You know, bending at the knees would really help that... Or, you know you could just solve the whole problem by getting women to stand up straight while you’re beating them. But then there’s that whole problem again. Because if they’re not standing up, how do you get them to stand up?... You beat them. But they can’t stand up while you’re beating them... That’s why you just can’t win with women.